Visits can range from attendance at Fermilab conferences and summer schools to year-long stays at the Lab. Proposals may be submitted twice a year, in February and August. Support provided by the program may include the following: travel and local lodging expenses during a series of short visits OR salary support and round trip travel expenses for an extended visit. Because these funds are provided by URA and come solely from contributions by URA member universities, the visitor’s home institution must agree to waive indirect costs, tuition, fees, and other administrative expenses. 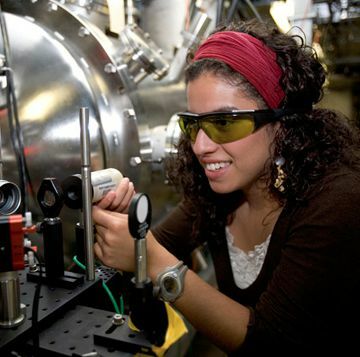 Individual proposals may be submitted by researchers who are faculty, postdocs, or graduate students at URA-member universities doing research in areas such as high energy physics experiments, astrophysics, theory, accelerator physics, materials science, computer science, engineering, and accelerator R&D related to the Fermilab mission. Applicants must be employed by or, in the case of graduate students, enrolled at URA member institutions during the course of the award. Proposals may be submitted for an individual award or, in limited circumstances, researchers in residence at Fermilab may submit a proposal for a laboratory- sponsored group activity (e.g., conferences, workshops, summer schools). Specific application requirements for the two types of proposals are described in the Application Proposal Requirements section. A proposal must be written and submitted by the intended awardee. Proposals developed or submitted by faculty on behalf of a student or colleague are not accepted. Individual awards may be up to a maximum of $50,000 in any twelve-month period with a lifetime maximum award total of $50,000 per individual. Applications are judged on the scientific merit of the proposed activity and on the cost-effectiveness of the proposal. As all URA institutions contribute to this program, over time, some consideration is given to the balance among URA institutions, both by region and type. Consideration is also given to the total amount of funds awarded to individual applicants and to institutions in past cycles. The allocation of awards is limited to funds contributed by member universities. Therefore, the URA review panel may deny or reduce some meritorious requests, particularly if they are deemed substantially more costly and/or less cost effective than the norm. For example, it is expected that most salary requests include some contribution from the home institution and most successful travel requests are kept low and cost effective. Use of onsite Fermilab housing is encouraged where possible. Fall awards are assumed to begin no later than March 31 of the following year. Spring awards are assumed to begin no later than September 30 in the year of application. Visiting Scholar funds are intended for scholarship. Requests to visit the laboratory solely for the purpose of operation of Fermilab facilities are discouraged. Funding is strictly for individuals and activities approved in award. No awards will be made to faculty or postdocs in the terminal year of their appointment. The Visiting Scholars award may not be used for travel away from Fermilab (e.g., to visit another facility or attend a conference) or solely for the purpose of operating Fermilab facilities. Awards may not be used for household moving expenses or in support of accompanying family members (e.g., family member travel to Fermilab). Support provided by the program may include the following: travel and local lodging expenses for a series of short visits OR salary support and round trip travel expenses for an extended visit, but not for both. Summer salary support is limited to two months. Awards may not fund activities occurring prior to the start date indicated in the award letter. Applicants should plan the submission of their proposals accordingly. There is a maximum award limit of $50,000 in a twelve month period and a lifetime limit of $50,000 per awardee. Applications for support are considered twice a year by a review panel composed of scientists drawn from URA-appointed universities. Laboratory representatives may serve in an advisory capacity. Award decisions are announced generally within six weeks of the closing date for applications. Awards may not fund activities occurring prior to the date of the award notification letter. The application deadline for the spring round of awards is the last Monday in February. Funding decisions are announced at the end of March. The application deadline for the fall round of awards is the last Monday in August. Funding decisions are announced at the end of September. Proposals must be submitted on-line. To register, please go to the VSP site: http://www.ura-hq.org/vsp/wp-login.php?action=register. You will be asked to provide a username and email address; a registration confirmation and password will be sent to the email address submitted, providing access to the VSP site. Format: 1 inch margins, font minimum 11 or 12 pt., common typeface (e.g., Arial, Palatino, Georgia), pages numbered. Brief description of the proposed research activity. Provide Fermilab sponsor/collaborator contact information. An automated request to provide a letter of support will be sent to the Fermilab sponsor’s email address provided by the applicant. The email will contain a link to the site where the letters of support should be uploaded. ‒ Project Description – 8 pages maximum: The project proposal should describe the proposed activity and its scientific and/or educational merit, and explain how URA funding will facilitate the proposed activity. ‒ Recipients of previous URA Visiting Scholars awards are expected to discuss accomplishments under the earlier award in their new proposal and include a copy of the URA VSP Project Report submitted at the close of the previously funded project. ‒ Budget – each proposal must contain a one page budget justification. Expenses must be itemized by type and cost. Provide name and email address of reference(s). An automated email request to provide a letter of support will be sent to the reference(s) along with a link to the site where the letters of support should be uploaded. ‒ Letter from Fermilab sponsor/collaborator. ‒ For a graduate student applicant: a letter from the faculty adviser supporting the application and detailing provisions for supervision of the student during the visit. ‒ For postdocs: a letter from the faculty adviser supporting the application. ‒ Letter from Grants or Sponsored Research Office of the home institution waiving indirect costs. ‒ Additional letters of support may be submitted, but are not required. Indicate dollar amount requested, proposed start date, and project duration. Other sources of support for proposed work and month/year of prior VS award support (if any). Provide contact information for Grant Officer. Read and accept the terms and conditions of the Visiting Scholars Program. Confirm accuracy of information provided and applicant identity. TAB 1 – Applicant and co-applicant information. a. Brief description of the proposed research activity. ‒ Budget – each proposal must contain a one page budget justification. Expenses and their relation to the proposed activities must be specified and itemized by attendee, indicating attendee length of stay at Fermilab for this activity (one night; two days, etc. ), and type of travel reimbursement costs requested. ‒ Bio sketch – 2 pages maximum for each applicant. a. Provide name and email address of Fermilab’s Deputy Director and, as appropriate, the Chief Research Officer, Chief Information Officer or Chief Accelerator Officer, depending on focus of proposed activity. The Fermilab sponsor will receive an automated email request to provide a letter of endorsement. Contained in the email request will be a link to the site where the letter of endorsement should be uploaded. a. Indicate amount requested, proposed start date, and project duration. b. Other sources of support for proposed work and month/year of prior VS award support (if any). a. Provide contact information for Fermilab’s Grant Officer. b. Read and accept the terms and conditions of the Visiting Scholars Program. c. Confirm accuracy of information provided and applicant identity. This program is administered by Universities Research Association, Inc., through reimbursement of expenses covered under the award to the researcher’s home institution. Award payments from URA will be made through the home institution of the awardee on receipt from the home institution of an invoice detailing actual costs incurred. Invoices for expenses covered by an award are to be submitted by the home institution’s grants officer (or equivalent) to the URA Corporate Office in Washington, DC for payment. Final invoices are to be submitted to URA no later than 90 days after expiration of the award. All covered expenses must have been incurred after the initiation of the award and prior to the expiration of the award. Visitors do not become Fermilab employees. They therefore must have a home institution and, if a visa is necessary, must obtain that visa through that institution. If needed, the Fermilab Visa Office can provide additional information. In cases where institutional health coverage from the home institution does not meet the requirements for longer stays at Fermilab, additional health coverage for the time at Fermilab must be obtained by the visitor or his/her institution. The cost of such supplemental coverage may be included in the budget. For general information on visiting and working at the Laboratory, please contact the Fermilab Users Office at 630-840-3111 or visit them on the website at http://wdrs.fnal.gov/users/. See previous recipients of a URA Visiting Scholars award.